A Kenyan author has been tipped to win the Nobel Prize for Literature, having steadily risen from being an outside bet to the bookies favourite. 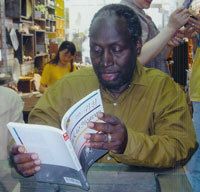 Ngugi wa Thiong’o is a social commentator, activist and professor at the University of California. His seminal linguistics and post colonial text Decolonising the Mind is the most well known work in his catalogue , but he has also written for childrens literature. Renewed interest in an author whose life narrative is as interesting as his array of accomplishments is testament to the spirit and pluck of a man who became a rebel after a play that he authored caused such uproar that he was imprisoned without trial in 1977. The play Ngaahika Ndeenda was the culmination of a period that saw Ngugi wa Thiong’o reject the English language and Christian faith. Up until that point his name had been James Ngugi. An explosive response to Ngaahika Ndeend (I will marry when I want) saw the then Kenyan Vice President, Daniel arap Moi order his arrest. Ngugi wa Thiong’o was imprisoned without trial at the Kamiti Maximum Security Prison, and it was while incarcerated that he wrote Caitaani mũtharaba-Inĩ (Devil on the Cross), on prison-issued toilet paper. Ngugi has been a imprisoned, exiled, revered and praised for his stance on many issues, but his politics remain the driving force behind his work. Fans have hailed Dreams in a time of a War and Wizard of the Crow as among his finest fictional works. Other nominees for the Nobel Prize for Literature include Dutch Poet Tomas Transtromer, and Japanese writer Haruki Marukami.